Gross Medical Malpractice related to blood transfusion seems to occur again at Coney Island Hospital in Brooklyn, New York. According to the New York Post, the hospital blood lab was shut down yesterday after a 40 year old man died following a botched transfusion in which he was given blood that had been mislabeled by a lab technician. Today the Daily News reports that an 86 year old lady died after she was given the wrong type of blood on June 9th, just a month ago. According to statistics the probability for a patient to receive the wrong type of blood is one out of every 14,000 transfusion. Coney Island Hospital has a history of serious malpractice in handling blood. From 1990 to 1994 the hospital recorded five nonfatal transfusion mistakes. In 1995 , Ira Medjuck , a 30 year old paramedic, agonized for a month before her death after she was given a botched blood transfusion. In 1995, Coney Island Hospital was fined by The New York State Health Department for “serious systematic problems” in handling blood. 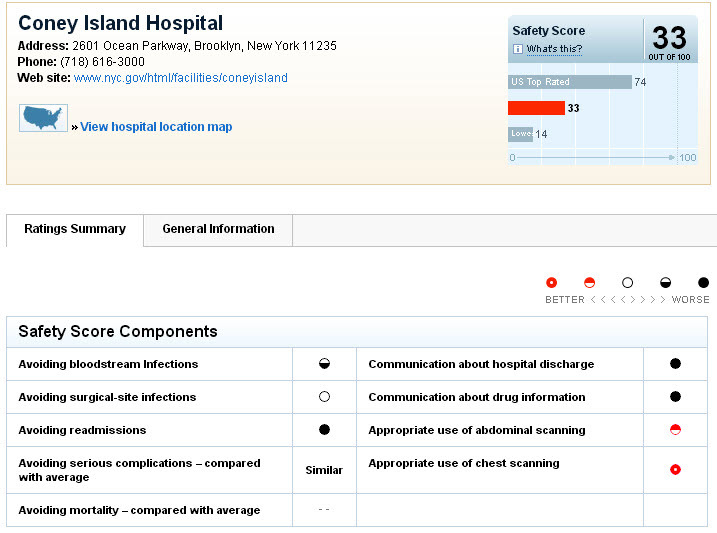 In a hospital safety rating survey published last May in ConsumerReports, Coney Island Hospital received a safety score of 33 out of 100, one of the lowest score among all New York Hospitals.